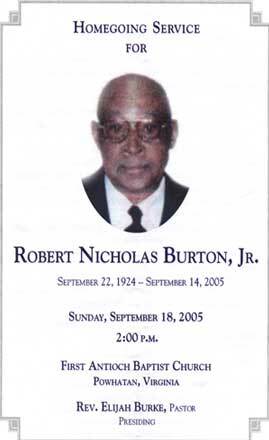 ROBERT NICHOLAS BURTON, JR. was called from labor to reward on September 14, 2005. He was born to the late Robert and Jannie Burton on September 22, 1924 in Powhatan, Virginia. At an early age he accepted Christ as his personal Lord and Savior. He attended school in Powhatan and retired from Richfood, Inc.
Nicholas loved to sing and was active in a vocal group. He sang with the male choir here at church. His favorite pastimes were fishing and gardening. He was a master at both. Nicholas was faithful to God, his family and church. He was kind, quiet and had a giving spirit. His footprints will forever remain in the many lives he touched. Nicholas was predeceased by his first wife Irma, four sisters, three brothers, and one granddaughter. He is survived by his wife, Margaret Manning Burton; six children, William (Vera), Ernest (Linda), Calvin (Mary), Celestine Cox (Preston), Virginia Burton, and Brenda Atkins (Charles); 39 grandchildren; 57 great-grandchildren; one sister Abbie Taylor; seven sisters-in-law; three brothers-in-law; a host of nieces, nephews, relatives and friends. No one can ever fill your place. Never will your memories fade.